Five weeks have passed since The Arrow's altercation with a mysterious man in a skull mask and Roy Harper's exposure to Mirakuru. As Oliver Queen scours the city looking for any clue to this mysterious new enemy and Roy copes with changes he can't begin to explain, a mad bomber begins to attack government offices around Starling City. Sebastian Blood is determined to prove he is unafraid of any terrorist and plans to hold a unity rally, come Hell or High Water. His courage has won him much public support - even the support of Oliver Queen and his family. But there is one person who thinks Blood has something to hide... Laurel Lance! Green Arrow: Year One (The Island sequences), Green Arrow: The Wonder Year (Oliver Queen befriends a politician while working to protect him as Green Arrow) and the Marv Woflman/George Perez run of Teen Titans (details involving Brother Blood's past). The chase scene with Arrow perusing Shrapnel's van is one of the best bits of stunt work in the show's history. In the comics, Shrapnel was a super-villain made of living organic metal. He could blow himself up and reconstitute himself at-will, essential being a living bomb. Unlike the political zealot we see on Arrow, the comics version of Shrapnel was a mercenary/assassin motivated by money rather than any kind of political or philosophical ideals. Shrapnel is addressed as Mr. Scheffer by the woman who buys a train set from him. This corresponds to Shrapnel's real name in the comics - Mark Scheffer. Shrapnel was the first super-villain Green Arrow fought in his own comic, following Mike Grell's departure from the series and DC Comics' decision to move Green Arrow back into the DC Universe at large after several years of basically existing apart from it. I wrote a review of this story, which you can read here. Sebastian Blood's aunt is being held at Saint Walker hospital. In the DC Comics Universe, Saint Walker is the name adopted by Bro'Dee Walker - an alien who became the first Blue Lantern. For the record, there is no Catholic saint named Walker. The name given for Sebastian Blood's aunt is Maya Resik. This is very close to Anna Resik - the first Mother Mayhem. Mother Mayhem is a title given to the consort of Brother Blood, who is meant to give birth to the next Brother Blood, according to the traditions of The Church of Blood in the Wolfman/Perez Teen Titans comics. According to the bill Laurel finds on Sebastian's desk, one of the US ZIP Codes for Starling City is 98114. In the real world, this ZIP Code is for Seattle, Washington - Green Arrow's home during the Mike Grell run on Green Arrow as well as his hometown in the New 52 DC Universe. Shrapnel is identified as being a frequent poster on the web forums for an anti-government group called The Movement. In the New 52 DC Universe, The Movement is a group of super-powered teenagers who use their abilities to fight corrupt government officials in the town of Coral City. One detail we learn of Sebastian Blood's background in this episode meshes fairly well with Brother Blood in the comics - he killed his own father. In the comics, it was a tradition in the Church of Blood that their leader could only take command by an act of patricide. The Arrow uses both an explosive arrow and a bola arrow while chasing down an informant in the opening sequence. The residue gathered by the police after Shrapnel's first bombing contains traces of nitroglycerin. Quentin Lance says this indicates someone with some explosives training rather than an amateur. Felicity says that Shrapnel's detonators operate on a cellular frequency past the 3800 MHz range approved for standard cellular transmissions. Shrapnel makes use of grenades - both explosive and smoke - in his escape from the scene of the second bombing. He is also capable of scrambling his cellular signals once he realizes how The Arrow is tracking him. Shrapnel claims to have planted fifty pounds of RDX explosives at the Unity Rally. RDX is an abbreviation for Research Department Explosive, referring to an explosive nitroamine widely used in military and industrial applications. It is one of the most powerful military-grade explosives in existence. Ollie: Speaking of which, how's Roy? Thea: Handsome. Brooding. The usual. Why is my boyfriend such a topic of interest? Thea: ... he showed up to work on time! Laurel: Sometimes I feel like I don't know the real Sebastian. He reminds me a little of you that way. Shrapnel: Freedom? Liberty? Justice? Long have the people of this city suffered under the shackles of a corrupt government. Slaves to self-interested politicians and their lobbyist puppeteers. I declare war on them all. Shrapnel: Drop the bow! I've got charges planted all over Starling! I drop this stick they all blow! Shrapnel: Did you just hear what I said? A news report informs us that the explosion at STAR Labs in Central City did not cause any damage nor did it release any radiation (209). Barry Allen was reportedly discovered in a coma. Felicity went to be with him and has spent much of the past five weeks away from Starling City, much to Oliver's annoyance (209). Laurel is still popping pills and has started stealing painkillers from her father to get her fix. Laurel investigated Cyrus Gold and notes that he was determined to have killed at least four police officers. She also notes Sebastian Blood's connection to the Langford Institute, which burned down under mysterious circumstances (209). 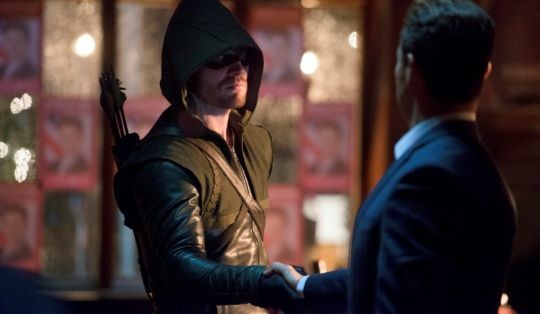 Over the past five weeks, Oliver has apparently befriended Sebastian Blood and he trusts the man enough to hold a fundraiser for him at Verdant. Blood calls himself a child of Starling City and notes his background as an orphan. When pressed on this by Laurel, he claims that he entered foster care after his drunken and abusive father was shot and killed by his mother, after a young Sebastian tried to stop him from hurting her. He claims Cyrus Gold was a preacher at the orphanage he grew up in and that he was the first person who could get him to speak following his witnessing his mother killing his father. Laurel discovers that Sebastian Blood is paying the medical bills for a woman named Maya Resik. Quentin investigates this lead and determines that Resik is Blood's aunt and that she's been in psychiatric care for years - hence why Blood became a ward of the state despite having a living relative. Diggle is capable of using Felicity's computers to hack into the police and fire radio bands for Starling City, but he's not comfortable with computers nor is he as fast at it as Felicity. Shrapnel publishes a 300 page manifesto after his first bombing. Diggle notes that nothing was stolen from the site of the bombing, suggesting Shrapnel to be an idealistic terrorist rather than a thief. Roy says he hasn't been sleeping much since he was kidnapped by Brother Blood's men. He exhibits signs of super-strength (catching a collapsing lighting-tower before it can hit Moira Queen) and healing a wound deep enough to require stitches in a matter of days with no visible scars. Thea notices both of these events by the end of the episode. Shrapnel works at a souvenir shop, which he has wired with RDX and laser trip-wires. Oliver's skill as an archer is such that he can shoot a grenade in mid-flight and cut the wire on a detonator at point-blank range. Diggle is shot in the shoulder while trying to stop Shrapnel but is on the road to recover by episode's end. By the end of the episode, it is revealed that the "crazy aunt" Sebastian Blood has been paying to have treated is actually his mother and she claims that Sebastian killed his own father. This fact is discovered by Laurel, who travels to the Saint Walker hospital to visit with Blood's aunt. Slade gives Ollie Shado's hood after they bury her. Sara notes that she read the report on the effects Mirakuru had on those who were injected with it, saying it warped either their bones or their minds, changing them into someone else. Slade is now strong enough to pick up Oliver, by the neck, one-handed. At the episode's end, Slade disappears with the Mirakuru supplies as Ivo threatens Sara and Ollie not with death but with life as his guinea pigs if they don't hand over the Mirakuru. After half a season of Laurel being the damsel-in-distress and the bad example, it's nice to see her old spirit returned as she investigates Sebastian Blood. In many ways, this episode is a step backwards, being reminiscent of other villain-of-the-week episodes that had little baring on the ultimate plot of the series during Season One. In nearly every other respect, however, this episode is a giant step forward as virtually every subplot on the show gets some forward momentum, from Ollie's relationship with Felicity to Roy's suddenly developing superpowers. Best of all, Laurel is acting like her old self once again and has her own storyline instead of being a supporting player to everyone else on the show. And while Shrapnel is a cardboard cut-out villain, Sean Maher does a great job with what he has to work with. It isn't a great episode but it is a good one.